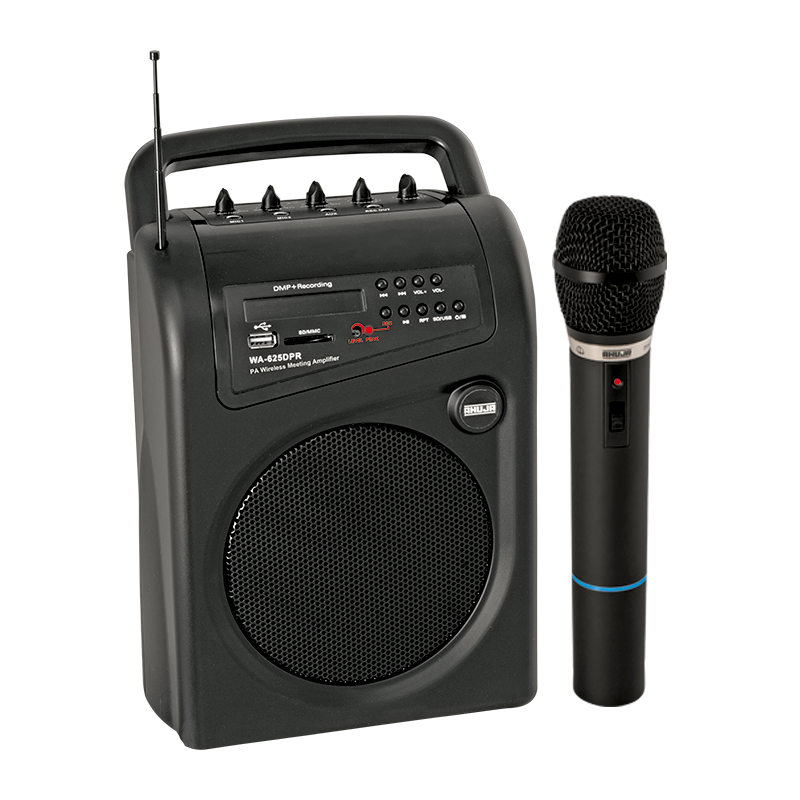 WA-625DPR is a compact, versatile and easily Portable PA System with built-in digital MP3 player and recorder. It is ideally suitable for classrooms, coaching centers, conference rooms, presentations, parties, bus tours, small religious gatherings and small outdoor gatherings. Built-in high quality MP3 playback and recording facility. Built-in VHF high band wireless receiver. Wireless transmitter supplied along with (available in different frequencies). Two microphone inputs and an Aux input (for connecting CD Player or mixer). Separate cut/boost type Bass & Treble controls. REC output available for connecting an external recorder or for connecting another amplifier. Operates on AC mains or 12V external battery or built-in 12V 3.5Ah rechargeable battery. Facility to recharge built-in 12V battery, rechargeable 9V battery and rechargeable 1.5V AA pencil cells. Provision for mounting the unit on a stand.